On the second floor of the West DUC, the room appears like a bright beacon — gleaming glass, sunny yellow walls, and furniture cast in rich shades of tangerine and deep violet. 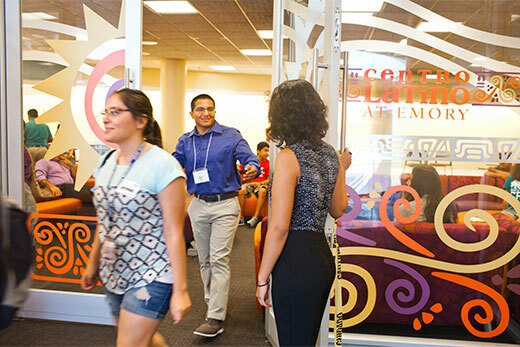 A flourish of Aztec-inspired designs and a stylized sun emblazon the double doors welcoming visitors to Centro Latino at Emory, a new space shaped by students and intended to kindle cultural connections. Although the center was completed in late May, programming officially kicked off Saturday, Aug. 22, with Bienvenidos, a new student orientation reception for Emory's first-year Latino/Latina and Hispanic heritage students and their families. To many Emory Latino and Latina students, the new space represents more than a study/lounge/meeting room. It's the start of something bigger — a symbolic welcome mat and an invitation from the university to consider the campus home. In addition, the new space provides a much-needed unifying presence for Latino students within the Emory community — as well as a launching pad for programs, ideas and connections, says Nathalie Angel 14C, who served on a series of student focus groups that helped design the new center. For Emory's Latino/Latina, Latin American and Hispanic heritage community, that's important, Angel says. Although Latino Americans represent the second fastest-growing ethnic group in the United States, "we represent a minority at Emory, where we can find it hard to connect," explains Angel, who is now a PhD student in the physical therapy division of the Emory School of Medicine. "That's because we're so diverse, coming from different ethnicities that encompass more than 20 countries," she adds. "We don't all look the same, nor do we share a single identity. And that's one of the reasons this is such a great asset for the Latino community — to have a space to meet, to see each other. A space that we can come together." From the color of the carpeting and upholstery to the graphics and wall structures, the new Centro Latino was intentionally shaped by Emory's Latino/Latina students themselves, says Michael Shutt, interim director of the Center for Diversity and Inclusion. "This was all about engaging students, and from the beginning they were very much part of the process," says Shutt. "What they wanted and needed was visibility." Creating a dedicated space to support Latino/Latina, Latin American and Hispanic heritage culture at Emory had actually been in discussion for several years, says M. DeLa Sweeney, interim director of the Office of Multicultural Programs and Services (OMPS) at Emory. "These kinds of spaces represent an institutional acknowledgement of the importance of racial identity for our students," explains Sweeney. More recently, discussions were reignited by the Campus Life Compact for Building an Inclusive Community at Emory, a series of recommendations and initiatives developed by an ad-hoc committee of students, faculty and administrators in response to campus conversations around issues of race, diversity and inclusion. After the Emory Black Student Union (EBSU) opened a dedicated space in the DUC in September 2013, dialogue began in earnest with Emory's Latino students "about their needs as individuals and as a community," Sweeney recalls. Three years ago, OMPS conducted a needs assessment of Hispanic students at Emory. "One idea that emerged was to have a physical space," Sweeney recalls. "The EBSU was a realization that it could happen." Bienvenidos — A new student orientation program that facilitates networking among incoming first-year Latino/Latina students and their families with other students, alumni and OMPS staff. La Sala —An informal gathering offered to strengthen their relationships and address challenges, incorporating food, music, games and dancing. Meets September -November and March-April on Thursdays at Centro Latino. To Jonathan Peraza 18C, who came to Emory just last year, Centro Latino is an exciting and welcome development. And he likes the fact that it was driven, in part, by students themselves. "Being a first-generation Latino student, my Latino identity is a big part of who I am, and I know it's the same for my peers," explains Peraza, an English and sociology major who helped select a design scheme for the center. "Many of us come here and find ourselves far from family, far from cultural ties," he says. "This gives us an affirming space to celebrate a common cultural heritage — a culture where education is valued — and to support each other to advance as a community." As for the finished product? "Beautiful, gorgeous — like the gates of heaven," he says. "It's been amazing to see it go from an idea to a space to actually doing all of the things we've imagined. It's wonderful. We're so grateful to have it." But for Latino/Latina undergraduate and graduate students who have been at Emory awhile — or even Latino alumni — the new center adds momentum to a bigger picture of positive changes that have been gaining steam over the past five years. "It means a lot to me that Emory is allocating resources and putting them into action," says Angel. "It's a huge gesture. And it's really comforting that we're being acknowledged on this campus." A grand opening for Centro Latino is slated for Homecoming Weekend on Friday, Sept. 25, from 6-7:30 p.m. For more information, contact Venus Miller at 404-727-3741 or venus.miller@emory.edu or OMPS at 404-727-6754.